The physical structure of white matter fiber bundles constrains their function. Any behavior that relies on transmission of signals along a particular pathway will therefore be influenced by the structural condition of that pathway. Diffusion-weighted magnetic resonance imaging provides localized measures that are sensitive to white matter microstructure. In this review, we discuss imaging evidence on the relevance of white matter microstructure to behavior. We focus in particular on motor behavior and learning in healthy individuals and in individuals who have suffered a stroke. We provide examples of ways in which imaging measures of structural brain connectivity can inform our study of motor behavior and effects of motor training in three different domains: (1) to assess network degeneration or damage with healthy aging and following stroke, (2) to identify a structural basis for individual differences in behavioral responses, and (3) to test for dynamic changes in structural connectivity with learning or recovery. White matter fiber pathways form the brain’s communication network. The physical condition of a given pathway will influence how effectively it can be used to transmit signals between brain regions and might thereby influence performance of behaviors that rely on that pathway (Fields, 2008). Individual differences in white matter structure may therefore be expected to correlate with variations in behavioral performance (Scholz et al., 2009b; Johansen-Berg, 2010). In addition, changes in white matter structure over time might accompany behavioral decrements or gains in performance due to disease, recovery or learning. This review considers evidence that an individual’s movement abilities are determined in part by white matter microstructure both in the healthy brain and following stroke. White matter microstructure can be interrogated non-invasively using diffusion-weighted magnetic resonance imaging (DWI). This imaging method probes tissue structure by measuring restrictions to local water diffusion. It has been suggested that cell membranes, myelin sheaths and the cytoskeleton, might hinder water diffusion (Beaulieu, 2002). If, due to the presence of cellular structures, water diffusion is no longer uniform in space, diffusion is called anisotropic (i.e., directionally dependent). In tissue with well-aligned structure, such as axons in white matter, this anisotropy reflects the underlying tissue structure. Here, diffusion is hindered by physical barriers, predominantly the axon membranes, in the direction perpendicular to the axons and relatively unrestricted parallel to it. Fractional anisotropy (FA) is a DWI-derived measure that quantifies the degree of anisotropy. FA is high (i.e., closer to 1) in highly organized white matter bundles, such as the corpus callosum and the corticospinal tract and low (i.e., closer to 0) in brain regions with little or no directional structure, such as cerebrospinal fluid within the ventricles. Damage to the brain, such as stroke, often disrupts white matter pathways, either directly (Stys, 2004) or through secondary degeneration (Kuhn et al., 1988). The “disconnection” that results from such damage can have significant functional consequences (Catani and ffytche, 2005) and recent studies have exploited DWI and tractography to relate damage to specific white matter pathways to particular impairments such as neglect or aphasia (Bird et al., 2006; Catani and Mesulam, 2008). Motor impairment is particularly common following stroke, affecting about 80% of patients, many of whom are left with a persistent disability (Jorgensen et al., 1995). This review will consider whether assessment of structural brain connectivity can offer valuable insights into motor impairment, recovery and rehabilitation. Although impairment can be reduced through rehabilitative interventions (Winstein et al., 2004; Stewart et al., 2006; Wolf et al., 2006), outcomes for individual patients are highly variable. It is likely that some of this variation is due to variation in residual brain anatomy. Imaging measures of white matter microstructure (potentially in combination with functional measures; Stinear et al., 2007) could be used to predict responses to an intervention in order to allow for individual tailoring of therapeutic interventions to optimize outcomes (Dobkin, 2004; Ward and Cohen, 2004). In addition, longitudinal imaging of patients could provide insights into putative substrates for rehabilitation-mediated improvements in performance. Repetitive motor task practice is a key component of many effective neurorehabilitation interventions (Langhorne et al., 2009). At a neuronal level, response to rehabilitation is thought to depend on brain systems typically employed for learning of novel motor skills (Karni and Bertini, 1997; Krakauer, 2006). Motor skill learning has therefore been used as an experimental model for rehabilitation following stroke (Pohl et al., 2001; Boyd and Winstein, 2003; Orrell et al., 2006; Stinear et al., 2007) and we propose that studying the systems involved in motor learning and practice in the healthy brain will help shed light on processes involved in motor recovery and rehabilitation following stroke. We will address similar questions in the healthy brain to those posed above for the damaged brain. Specifically, do individual differences in structural connectivity correlate with variations in behavior and can changes in structural connectivity be induced by training? We will focus on the degree to which imaging measures of structural brain connectivity can inform our study of motor behavior and motor training in the healthy brain and following stroke in three different domains: (1) to assess network degeneration with healthy aging and following stroke, (2) to identify a structural basis for individual differences in behavioral responses, and (3) to test for dynamic changes in structural connectivity with learning or recovery. Many physiological and pathological changes occur during the healthy aging process, but a particularly consistent change is a gradual decrease over time in the number of neurons as they die and are not replaced. Neuronal death is followed by a gradual degeneration of the proximal axons; a process known as Wallerian degeneration (Waller, 1850). As the axons degenerate, the surrounding structures and myelin sheaths are also lost, resulting, theoretically at least, in a greater overall decrease in total white matter volume than in gray matter volume. Post-mortem studies have reported a gradual decline in brain weight after the age of 60 (Mrak et al., 1997) and have shown that this is primarily caused by significant loss of white matter volume (Meier-Ruge et al., 1992; Mrak et al., 1997). However, the results from conventional in vivo MRI studies are not entirely consistent with these post-mortem findings. A number of MRI studies have shown a gradual loss of the gray matter specifically from young adulthood onwards (Ge et al., 2002; Sowell et al., 2003; Walhovd et al., 2005; Lehmbeck et al., 2006), but have also described a concomitant non-linear increase in white matter volume until the end of the fifth decade before a gradual decline with advancing age (Bartzokis et al., 2001; Ge et al., 2002; Sowell et al., 2003; Walhovd et al., 2005). Studies using DWI to assess age related white matter change have demonstrated that FA is potentially a more sensitive metric to assess microstructural degeneration of brain networks than conventional structural MR, with decreases in FA observed from young (23–40 years) to middle (41–59 years) adulthood (Salat et al., 2005; Ardekani et al., 2007; Giorgio et al., 2010), at a time when the total volume of white matter in the same subjects was relatively stable (Giorgio et al., 2010) (Figure 1). Decreases in FA continue to occur after this time, even in healthy aging in people without atypical cortical atrophy or a large number of white matter lesions (O’Sullivan et al., 2001; Head et al., 2004; Madden et al., 2004; Giorgio et al., 2010; Michielse et al., 2010). Figure 1. Structural brain changes with age. Comparisons of fractional anisotropy (blue), gray matter volume (green), and white matter volume (yellow) between young (aged 23–40 years), middle-aged (aged 41–60 years), and older (aged 60–82 years) adults. (A) Comparisons between the young and middle-aged groups revealed widespread reductions in fractional anisotropy and reductions in GM density predominantly in frontal lobe. (B) Comparisons between middle and older aged adults revealed later reductions in white matter and gray matter volume. (C) Comparisons between young and older adults revealed widespread reductions in all measures. Adapted from Giorgio et al. (2010) with permission. Although structural changes with age are diffuse and widespread across the white matter, regional differences in the rate of decline in FA have been reported, with greater decreases in FA (and therefore greater inferred disruption in the white matter structure) in frontal areas, with temporal and posterior areas relatively preserved until later stages of aging (Abe et al., 2002; Salat et al., 2005; Ota et al., 2006; Sullivan et al., 2006; Michielse et al., 2010), though the degree to which this differential is evident varies between studies (Giorgio et al., 2010). While the preferential loss of prefrontal white matter integrity has been demonstrated with aging even in highly functioning older people (Pfefferbaum et al., 2005), reduced FA in frontal white matter have been found to correlate with poor performance on a test executive function in healthy elderly adults with normal structural MRI scans (O’Sullivan et al., 2001). However, when compared with age-matched healthy adults, patients with early stage dementia did not have significantly greater white matter abnormalities within frontal regions but did have greater disruption to posterior white matter (Head et al., 2004). 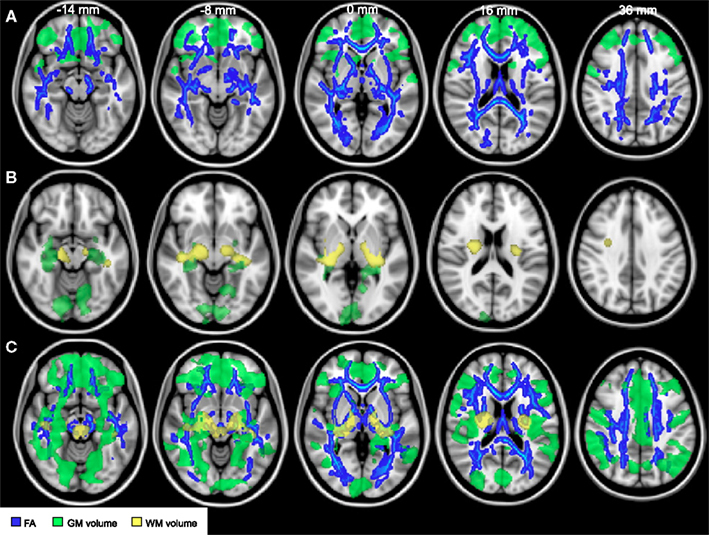 These findings, in groups of individuals in whom conventional structural imaging is likely to be normal, highlight the sensitivity of diffusion imaging as a technique for investigating subtle changes in network structure, and its potential not only to identify disruption in white matter tracts over time with healthy aging, but as a tool to distinguish pathological processes from normal aging. In addition, changes in white matter metrics over time may allow investigation of the relationship between white matter deterioration and cognitive decline. One study has investigated the relationship between FA and response times in a visual detection task. In young adults (19–25 years) response times correlated with FA in the splenium of the corpus callosum whereas for older adults (60–70 years) response times were best correlated with FA in the anterior limb of the internal capsule. This distinction between age groups suggests that there is an alteration in cortical networks required to perform a task with increasing age (Madden et al., 2004). In the clinic, diffusion MRI has a well-established role in detecting acute stroke pathology, and is a more sensitive and specific imaging modality than conventional MRI or CT for detection of early ischemic signs in the hyperacute setting (Saur et al., 2003). Both gray and white matter are vulnerable to primary ischemic damage (Stys, 2004) and, following the acute stage, slowly evolving secondary degeneration of white matter can occur. DWI can detect these patterns of anterograde (Wallerian) and retrograde white matter tract degeneration in the days and months following stroke (Werring et al., 2000; Pierpaoli et al., 2001; Thomalla et al., 2004; Liang et al., 2007) (Figure 2). In the acute phase, reductions in FA have been observed within 16 days of stroke within distant regions within the corticospinal tract, at a time when conventional MRI was normal in this area (Thomalla et al., 2004). 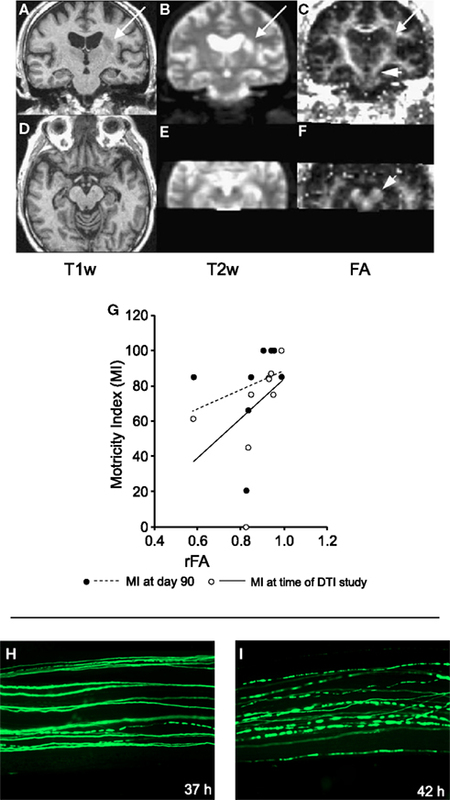 This decrease in FA is in line with the temporal evolution of Wallerian degeneration in these tracts, which has been demonstrated to occur as early as 2–7 days after experimental ischemic lesions in rat models (Iizuka et al., 1990). In a study by Thomalla et al. (2004), the degree of FA decrease was correlated with the patient’s clinical score at the time of the MRI (Figure 2G), suggesting that these changes may have functional importance, but despite this cross-section relationship the FA decrease in the acute phase did not predict clinical outcome 3 months later. Figure 2. White matter degeneration following damage. (A–G) Effects of stroke. (A–F) Coronal (top row) and axial (bottom row) MR sections taken in a patient with left striatocapsular infarction, 12 days after onset. The lesion area can be localized on T1- (A,D) and T2- (B,E) weighted scans. Fractional anisotropy (FA) is not only reduced in the lesion area, but also further along the pyramidal tract (C) and in the cerebral peduncle (F, short arrows). (G) The fractional anisotropy ratio between affected and unaffected side (rFA) for the cerebral peduncle correlates with the Motricity Index. Individuals with a more symmetric fractional anisotropy distribution had better motor performance. (H,I) Example of Wallerian degeneration in the peripheral nervous system. The example shows Wallerian degeneration in a mouse peripheral nerve after cut injury. (H) Thirty-seven hours after cut injury with few individual fluorescent axons are broken into fragments. (I) Forty-two hours after cut injury most labeled axons appear fragmented. (A–G) Adapted with permission from Thomalla et al. (2004). (H,I) Adapted with permission from Beirowski et al. (2005). Structural studies in the chronic stages of stroke recovery have tended to highlight damage or degeneration of pathways in the stroke-affected hemisphere but studies of remote functional change following stroke have identified the phenomenon of transhemispheric diaschisis (Andrews, 1991), raising the possibility that more remote interconnected regions, even in the contralesional hemisphere, undergo alterations following stroke. However, the fact that white matter microstructural changes in the contralesional hemisphere are not typically found in MRI studies (Liang et al., 2007), suggests that, if present, such changes are subtle or variable in spatial distribution. One promising approach for detecting subtle or spatially variable changes in structural connectivity is to use complex network analysis methods. These are a class of techniques that have been employed to interrogate network structure in a variety of contexts such as protein interactions, social networks or the internet (Barabasi, 2009), and that have proved powerful in exploring the network structure of the brain (Bullmore and Sporns, 2009). We recently used a novel network measure of weighted communicability (Estrada and Hatano, 2008; Crofts and Higham, 2009) to assess differences in structural connectivity between stroke patients and age-matched healthy controls using probabilistic tractography on diffusion data to generate estimates of structural connectivity between brain regions (Crofts et al., 2010). Communicability measures the ease with which information can travel between brain regions by considering not only the direct path between them but also all possible indirect paths. We used clustering methods to test whether or not this measure could differentiate between structural brain networks of chronic stroke patients and controls. When considering data from the stroke hemisphere (Figure 3A) we found a clear separation between patients and controls – as expected given the presence of a lesion and widespread degeneration in this hemisphere (Werring et al., 2000; Pierpaoli et al., 2001). However, more surprisingly, we also found that clustering differentiated between patients and controls even when considering only the structural connections of the contralesional hemisphere (Figure 3B). This suggests that subtle changes in structural connectivity, that are not apparent on conventional MRI or maps of FA (Liang et al., 2007), are present bilaterally following stroke and potentially provide a structural correlate of transhemispheric diaschisis (Andrews, 1991). The separation between groups depended on communicability changes in a few brain regions (Figure 3C). Our patients all had left hemisphere subcortical strokes around the basal ganglia/internal capsule and regions of reduced communicability clustered around this area in the stroke hemisphere and around remote, but interconnected, mirror locations in the contralesional hemisphere. This pattern of change is consistent with the idea that, in addition to direct ischemic damage to white matter, secondary degeneration occurs along distributed white matter pathways. Figure 3. Network analysis detects changes in contralesional structural connectivity following stroke. (A,B) Results of reordering of participants using structural connectivity data. Chronic stroke patients are indicated by red circles and age-matched healthy controls by blue stars. Ordering of participants is achieved using spectral reordering and is based on the right singular vector, v, which is plotted on the y-axis (see Crofts et al., 2010 for details). Individuals are ordered along the x-axis based on increasing values of [v]2. Clear separation between patients and controls is apparent when using communicability information from both the lesioned (A) and the contralesional hemisphere (B). (C) Areas driving the separation between patients and controls are shown in blue. These regions have significantly lower communicability in patients compared to controls. They tend to be clustered around the lesion location (overlap map of lesions is shown in red to yellow). Based on data presented in Crofts et al. (2010). To what extent do changes in structural connectivity following stroke have functional consequences? It is well-established that the functional (Rapisarda et al., 1996; Delvaux et al., 2003; Brouwer and Schryburt-Brown, 2006) or structural (Jang et al., 2005; Jang et al., 2008) integrity of the corticospinal tract in the lesioned hemisphere is a major determinant of motor recovery following stroke. Recent studies, however, suggest that motor performance following stroke may have a more complex dependence on widespread pathways, not limited to primary corticospinal outputs from the lesioned hemisphere. For example, Schaechter et al. (2009) reported that a motor skill measure (a composite score based on pegboard performance and index finger tapping speed) correlated with bilateral clusters in the posterior limb of the internal capsule. Post hoc analysis suggested that while poorly recovered patients had reduced FA relative to controls in the contralesional posterior limb of the internal capsule, well-recovered patients had elevated FA relative to controls. The authors therefore suggest that motor performance following stroke depends on the net effect of degeneration and remodeling of motor related pathways in both hemispheres. The fact that we can find such brain–behavior relationships raises the possibility that imaging measures of structural connectivity could be used to predict how an individual might behave in a particular scenario. From a clinical perspective this suggests opportunities to define imaging biomarkers that could be used to predict behavioral responses to a therapeutic intervention. A previous study has attempted to define baseline measures able to predict response to a subsequent training intervention by assessing the structural and functional integrity of the corticospinal tract in chronic stroke patients who went on to receive a 30-day program of motor training (Stinear et al., 2007). For the subgroup of patients with poor residual functional connectivity in the affected corticospinal tract (as defined by the absence of an identifiable muscle response to transcranial magnetic stimulation of the affected motor cortex), the response to training depended on the structural integrity of the corticospinal tract: those with lower structural integrity of the affected corticospinal tract (measured using FA) showed no functional improvements (Stinear et al., 2007). In the healthy brain, significant relationships have been detected between white matter microstructure and behavior across a broad range of cognitive tasks (Figure 4) (Johansen-Berg, 2010). These findings suggest that even in healthy subjects, subtle variations in brain anatomy have consequences for behavior. For example, better performance on a bimanual co-ordination task is associated with increased white matter integrity in the body of the corpus callosum, suggesting that callosal connections between medial wall areas are most critical in bimanual motor co-ordination (Johansen-Berg et al., 2007) (Figure 4A). In the majority of published studies, correlations between behavioral performance and FA within task-relevant pathways is positive – such that better performance is associated with higher FA. This is intuitively attractive as higher FA is associated with anatomical properties, such as increased myelination, that we might expect to speed conduction time, and so enhance performance (Fields, 2008). However, one study reports the opposite pattern: slower performance on a simple choice reaction time task is associated with higher FA in the right optic radiation, which might sub-serve the visuospatial component of the task (Tuch et al., 2005) (Figure 4B). This result does not fit the simple-minded idea that “bigger is better” when it comes to FA. However, FA is a complex measure that does not always relate in a straightforward way to fiber architecture. One explanation of the observed relationship, for example, is the complex crossing fiber architecture in this specific region, where increased myelination or axonal coherence of one fiber population could lead to an overall decrease in FA within a voxel. Figure 4. Relationship between fractional anisotropy (FA) and behavioral indices for a range of different tasks. Brain images show voxels where a significant correlation was found. Scatter plots illustrate spread of behavioral and fractional anisotropy values across subjects. (A) Individuals with higher callosal fractional anisotropy performed better at an asynchronous bimanual finger-tapping task (closed circles represent males, open circles females). (B) Counter-intuitively, individuals with higher fractional anisotropy in the right optic radiation (OR) performed worse on a choice reaction time task (i.e., had higher reaction times). (C) Individuals with higher fractional anisotropy averaged over tracts arising from Broca’s area were better at implicitly extracting grammatical rules from artificial grammars. (D) Higher fractional anisotropy in the fornix tail was found to be associated with significantly better recollection memory. (A) Adapted from Johansen-Berg et al. (2007) with permission; (B) adapted from Tuch et al. (2005) with permission; (C) adapted from Floel et al. (2009) with permission; (D) adapted from Rudebeck et al. (2009) with permission. Not only general motor performance, but also changes in motor performance that occur during learning are related to white matter microstructure. For example, the rate of adaptation in a visuo-motor tracking task correlated with FA in the cerebellum (Della-Maggiore et al., 2009). Some of these structurally correlating regions have also been found to be functionally more active in individuals who are faster at learning a similar task (Della-Maggiore and McIntosh, 2005). Microstructural variation in cerebellar white matter, as well as white matter underlying dorsal premotor cortex, has also been related to variation in performance on visuo-motor tracking task in which individuals learn a sequence of repeating hand grip forces (Tomassini et al., 2010). Taken together, this evidence suggests that the cellular features associated with increased FA in the cerebellum might support more efficient communication between cerebellar regions and other cortical and subcortical regions important for visuo-motor adaptation. Correlations between learning-related behavioral change and brain structure have been found in other domains such as language. Individuals who were better at learning an artificial grammar had higher FA in white matter integrity surrounding Broca’s area, and within cortico-cortical fibers arising from this area. This suggests that rule-based grammar learning might rely on and potentially benefit from increased connectivity of Broca’s area (Floel et al., 2009) (Figure 4C). A number of recent studies have shown that variations in performance of specific aspects of memory can also be related to structural variation in particular white matter pathways. For example, microstructure of white matter within the left uncinate fasciculus was related to auditory–verbal memory in children and adolescents (Mabbott et al., 2009). Further, inter-individual differences in the white matter microstructure in the fornix, the main link between episodic-memory regions of the medial temporal lobe and medial diencephalon, were found to reflect variations in recollection memory performance (Rudebeck et al., 2009) (Figure 4D). Finally, inter-individual differences in true and false memory retrieval has been associated with differences in FA in inferior and superior longitudinal fascicles respectively (Fuentemilla et al., 2009). The results of cross-sectional studies of behavior–structure correlations, such as those discussed above, need to be interpreted carefully. Inter-individual differences in brain structure might be the result of variations in life experience or of different genetic predispositions. In other words, greater white matter integrity might reflect cellular changes caused by experience. Alternatively, an individual might have been born with a white matter pathway that supports a particular skill. These two scenarios illustrate the fact that it is difficult to distinguish genetic, epigenetic, and experience-related factors with cross-sectional paradigms, a shortcoming that can only be addressed with longitudinal imaging. The prospect that brain structures can change in response to experience, training or practice even in adults holds promise for patients recovering from injury or disease. Recent imaging studies provide evidence in both healthy individuals and stroke patients that dynamic changes in white matter microstructure can be induced by experience. For example, a recent study showed an increase in FA in children (8–10 years) with poor reading skills who underwent 100 h of intensive reading training over a 6-month period (Keller and Just, 2009). The increase in FA in the left anterior centrum semiovale correlated with improvement in phonological decoding ability. This suggests that, at least in the young brain, targeted behavioral intervention can bring about changes in task-specific cortico-cortical white matter tracts. It might be the case that white matter is only malleable during the first two decades of life, when ongoing maturation takes place (Casey et al., 2005). However, we recently found evidence that white matter continues to be susceptible to structural change even in adulthood (Scholz et al., 2009a). 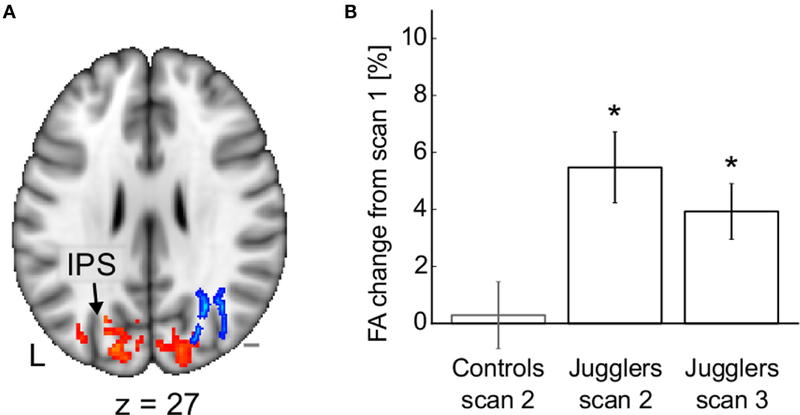 In response to 6 weeks of juggling training FA changed in white matter underlying the intraparietal sulcus of previously naïve adults (21–32 years) (Figure 5). These white matter changes were accompanied by structural changes in overlying gray matter regions. This suggests that brain matter continues to be malleable during adulthood and that learning might rely on reorganization of specific brain regions and their connections. Figure 5. Structural changes after juggling training. (A) Fractional anisotropy (blue) and gray mater density (red) increase in occipito-parietal areas following the training period. (B) Mean fractional anisotropy change from scan 1 in the cluster shown in (A). Adapted from Scholz et al. (2009a) with permission. To what extent can such remodeling be harnessed in response to damage? There is currently little direct evidence from human studies for white matter remodeling after stroke. As discussed above, cross-sectional studies have demonstrated that the FA within the contralesional internal capsule correlates with residual function in the paretic hand (Schaechter et al., 2009). However, by their cross-sectional nature, such studies are not able to determine what these brain–behavior relationships reflect. The observed relationships between motor performance and structural integrity could be due to pre-existing differences in white matter structure between the patients in these areas, to the effects of ischemic damage or secondary degeneration or to positive remodeling of the tracts during recovery. One observation from the study by Schaechter et al. (2009) supports that notion that white matter remodeling may occur at least in some patients. They found that patients who had made a poorer functional recovery had lower FA in the contralesional corticospinal tract than age-matched healthy controls. However, patients who had made a better recovery had higher FA than healthy controls within the contralesional corticospinal tract, although this was in a more inferior region than that demonstrating the correlation with behavior (Schaechter et al., 2009). One recent study has sought to answer the question of causality directly using a longitudinal study design. Schlaug et al. (2009) investigated the strength of the arcuate fasciculus; the white matter connection between the two major language centers, Broca’s area and Wernicke’s area, in six stroke patients with chronic aphasia, before and after a intensive period of 75–80 daily sessions of intonation-based speech therapy. All patients’ speech improved after training and there was an increased number of tractography-derived “fibers” in the arcuate fasciculus in the right hemisphere after therapy, a finding the authors suggest represents an increased recruitment of the homologues of the speech areas within the right hemisphere. This finding was specific to the right arcuate fasciculus and was not seen in the corticospinal tract. In addition, for these six patients, a relationship was observed between increase in number of fibers and improvement in clinical score, such that patients who demonstrated the greatest speech improvements also had the greatest increase in fiber number. Although the study is limited by the relatively small number of patients, these initial findings suggest that, in line with animal models, remodeling of white matter may occur in regions distant to the lesion after stroke. However, although it is tempting to interpret tractography-derived fiber number as a measure of density of axonal projections between two regions, there are numerous other factors that will influence such the performance of a tractography algorithm (such as tract geometry, length, data quality etc) (Johansen-Berg and Behrens, 2006). It would be useful to test the effects of such an intervention on a range of diffusion and other structural measures in order to gain a better understanding of potential biological events that underlie the observed change. More generally, understanding the biological basis of changes in diffusion parameters is challenging. What do observed changes in MR measures of white matter signify in terms of cellular changes? Here animal studies of white matter plasticity can give clues to the most likely underlying structural changes. In vitro experiments have shown that myelination can be positively and negatively regulated by increasing and decreasing the firing rate of neurons with neurotoxins (Demerens et al., 1996). Alterations in white matter microstructure have also been observed in studies of behaving animals with training or recovery from damage (Johansen-Berg, 2007). In macaque monkeys that were trained for 2 weeks to retrieve food with a rake, tracers revealed more connections between the temporo-parietal junction and the intraparietal sulcus compared to a control group (Hihara et al., 2006), suggesting that the experience of training had led to cortico-cortical rewiring. Such rewiring has also been observed in response to brain damage; in squirrel monkeys that had received a lesion to the primary motor cortex, axons originating in the ventral premotor cortex were found to grow around the lesioned area to innervate somatosensory cortex (Dancause et al., 2005). Because somatosensory cortex projects directly to the spinal cord, this re-routing might provide an alternative route for premotor cortex to innervate the spinal cord following motor cortex damage. Therefore, animal studies have identified potential mechanisms for observed patterns of white matter microstructural change with learning or recovery. Future studies could aim to perform imaging and histological analyses in parallel in order to test more directly hypotheses on their correspondence. For example, it has been suggested that changes in FA observed in the songbird brain are correlated with changes in myelination observed with histology (De Groof et al., 2008). The songbird brain undergoes dramatic structural changes in a seasonal cycle. It is possible that these changes involve both the creation of new axons or axon collaterals as well as the modification of existing circuitry by changes in myelination. In the context of disease, a recent study in a rat model found that, after an initial decrease in FA in the area surrounding an experimental lesion, FA increased over 6 weeks. Subsequent histological investigations suggested that the increased FA reflected increasing axon density with recovery (Ding et al., 2008). The physical structure of white matter pathways influences behavior both in healthy individuals and following stroke. Damage or degeneration of pathways with healthy aging (Salat et al., 2005; Ardekani et al., 2007; Giorgio et al., 2010) or following stroke (Werring et al., 2000; Pierpaoli et al., 2001; Thomalla et al., 2004) can be detected using diffusion MRI and has consequences for behavior (O’Sullivan et al., 2001; Madden et al., 2004). Measures of white matter microstructure in specific pathways related to motor execution and motor learning can be used to predict recovery following stroke (Jang et al., 2008) or response to intervention (Stinear et al., 2007) across groups of individuals. Future studies should assess the degree to which such measures could be used to design targeted interventions for individual patients. It is likely that combination of multi-modal structural imaging measures, along with measures of functional connectivity provided by imaging or electrophysiology (Stinear et al., 2007), will be most powerful in predicting individual responses. Even in healthy individuals, inter-individual variations in white matter microstructure of task-relevant pathways can predict variation in behavioral performance in motor, cognitive and learning domains (Scholz et al., 2009b; Johansen-Berg, 2010). Finally, recent evidence suggests that white matter microstructure may be susceptible to experience-dependent modification (Keller and Just, 2009; Scholz et al., 2009a). Future studies should test whether such changes can be detected in response to rehabilitation following stroke (Schlaug et al., 2009) and, if so, whether they can be used to identify potential therapeutic targets. However, the clinical relevance of such observations is currently limited by the challenge of interpreting changes in diffusion MRI measures in biological terms (Beaulieu, 2009). Further studies in animal models, in which imaging and histological measures can be taken in the same individuals, will be useful to probe the biological basis of such changes. We are grateful for financial support from the Wellcome Trust (Heidi Johansen-Berg and Jan Scholz) and NIHR Biomedical Research Centre, Oxford (Heidi Johansen-Berg and Charlotte J. Stagg). Abe, O., Aoki, S., Hayashi, N., Yamada, H., Kunimatsu, A., Mori, H., Yoshikawa, T., Okubo, T., and Ohtomo, K. (2002). Normal aging in the central nervous system: quantitative MR diffusion-tensor analysis. Neurobiol. Aging 23, 433–441. Andrews, R. J. (1991). Transhemispheric diaschisis. A review and comment. Stroke 22, 943–949. Ardekani, S., Kumar, A., Bartzokis, G., and Sinha, U. (2007). Exploratory voxel-based analysis of diffusion indices, and hemispheric asymmetry in normal aging. Magn. Reson. Imaging 25, 154–167. Barabasi, A. L. (2009). Scale-free networks: a decade, and beyond. Science 325, 412–413. Bartzokis, G., Beckson, M., Lu, P. H., Nuechterlein, K. H., Edwards, N., and Mintz, J. (2001). Age-related changes in frontal, and temporal lobe volumes in men: a magnetic resonance imaging study. Arch. Gen. Psychiatry 58, 461–465. Beaulieu, C. (2002). The basis of anisotropic water diffusion in the nervous system – a technical review. NMR. Biomed. 15, 435–455. Beaulieu, C. (2009). “The biological basis of diffusion anisotropy,” in Diffusion MRI: From Quantitative Measurement to In-vivo Neuroanatomy, eds H. Johansen-Berg and T. E. J. Behrens (London: Elsevier), 105–126. Beirowski, B., Adalbert, R., Wagner, D., Grumme, D. S., Addicks, K., Ribchester, R. R., and Coleman, M. P. (2005). The progressive nature of Wallerian degeneration in wild-type, and slow Wallerian degeneration (WldS) nerves. BMC Neurosci. 6, 6. Bird, C. M., Malhotra, P., Parton, A., Coulthard, E., Rushworth, M. F., and Husain, M. (2006). Visual neglect after right posterior cerebral artery infarction. J. Neurol. Neurosurg. Psychiatry 77, 1008–1012. Boyd, L. A., and Winstein, C. J. (2003). Impact of explicit information on implicit motor-sequence learning following middle cerebral artery stroke. Phys. Ther. 83, 976–989. Brouwer, B. J., and Schryburt-Brown, K. (2006). Hand function, and motor cortical output poststroke: are they related? Arch. Phys. Med. Rehabil. 87, 627–634. Bullmore, E., and Sporns, O. (2009). Complex brain networks: graph theoretical analysis of structural, and functional systems. Nat. Rev. Neurosci. 10, 186–198. Casey, B. J., Tottenham, N., Liston, C., and Durston, S. (2005). Imaging the developing brain: what have we learned about cognitive development? Trends Cogn. Sci. 9, 104–110. Catani, M., and ffytche, D. H. (2005). The rises, and falls of disconnection syndromes. Brain 128(Pt 10), 2224–2239. Catani, M., and Mesulam, M. (2008). The arcuate fasciculus, and the disconnection theme in language, and aphasia: history, and current state. Cortex 44, 953–961. Crofts, J. J., and Higham, D. J. (2009). A weighted communicability measure applied to complex brain networks. J. R. Soc. Interface 6, 411–414. Crofts, J. J., Higham, D. J., Bosnell, R., Jbabdi, S., Matthews, P. M., Behrens, T. E. J., and Johansen-Berg, H. (2010). Network analysis detects changes in the contralesional hemisphere following stroke. Neuroimage doi: 10.1016/j.neuroimage.2010.08.032. [Epub ahead of print]. De Groof, G., Verhoye, M., Van Meir, V., Balthazart, J., and Van der Linden, A. (2008). Seasonal rewiring of the songbird brain: an in vivo MRI study. Eur. J. Neurosci. 28, 2475–2485; discussion 4. Della-Maggiore, V., and McIntosh, A. R. (2005). Time course of changes in brain activity, and functional connectivity associated with long-term adaptation to a rotational transformation. J. Neurophysiol. 93, 2254–2262. Della-Maggiore, V., Scholz, J., Johansen-Berg, H., and Paus, T. (2009). The rate of visuomotor adaptation correlates with cerebellar white-matter microstructure. Hum. Brain Mapp. [Epub ahead of print]. Delvaux, V., Alagona, G., Gerard, P., De Pasqua, V., Pennisi, G., and de Noordhout, A. M. (2003). Post-stroke reorganization of hand motor area: a 1-year prospective follow-up with focal transcranial magnetic stimulation. Clin. Neurophysiol. 114, 1217–1225. Demerens, C., Stankoff, B., Logak, M., Anglade, P., Allinquant, B., Couraud, F., Zalc, B., and Lubetzki, C. (1996). Induction of myelination in the central nervous system by electrical activity. Proc. Natl. Acad. Sci. U.S.A. 93, 9887–9892. Ding, G., Jiang, Q., Li, L., Zhang, L., Zhang, Z. G., Ledbetter, K. A., Panda, S., Davarani, S. P. N., Athiraman, H., Li, Q., Ewing, J. R., and Chopp, M. (2008). Magnetic resonance imaging investigation of axonal remodeling, and angiogenesis after embolic stroke in sildenafil-treated rats. J. Cereb. Blood Flow Metab. 28, 1440–1448. Dobkin, B. H. (2004). Strategies for stroke rehabilitation. Lancet Neurol. 3, 528–536. Estrada, E., and Hatano, N. (2008). Communicability in complex networks. Phys. Rev. E. Stat. Nonlin. Soft Matter Phys. 77(Pt 2), 036111. Floel, A., de Vries, M. H., Scholz, J., Breitenstein, C., and Johansen-Berg, H. (2009). White matter integrity in the vicinity of Broca’s area predicts grammar learning success. Neuroimage 47, 1974–1981. Fuentemilla, L., Camara, E., Munte, T. F., Kramer, U. M., Cunillera, T., Marco-Pallares, J., Tempelmann, C., and Rodriguez-Fornells, A. (2009). Individual differences in true, and false memory retrieval are related to white matter brain microstructure. J. Neurosci. 29, 8698–8703. Ge, Y., Grossman, R. I., Babb, J. S., Rabin, M. L., Mannon, L. J., and Kolson, D. L. (2002). Age-related total gray matter, and white matter changes in normal adult brain. Part I: volumetric MR imaging analysis. AJNR Am. J. Neuroradiol. 23, 1327–1333. Giorgio, A., Santelli, L., Tomassini, V., Bosnell, R., Smith, S., De Stefano, N., and Johansen-Berg, H. (2010). Age-related changes in grey, and white matter structure throughout adulthood. Neuroimage 51, 943–951. Head, D., Buckner, R., Shimony, J., Williams, L., Akbudak, E., Conturo, T., McAvoy, M., Morris, J. C., and Snyder, A. Z. (2004). Differential vulnerability of anterior white matter in nondemented aging with minimal acceleration in dementia of the Alzheimer type: evidence from diffusion tensor imaging. Cereb. Cortex 14, 410. Hihara, S., Notoya, T., Tanaka, M., Ichinose, S., Ojima, H., Obayashi, S., Fujii, N., and Iriki, A. (2006). Extension of corticocortical afferents into the anterior bank of the intraparietal sulcus by tool-use training in adult monkeys. Neuropsychologia 44, 2636–2646. Iizuka, H., Sakatani, K., and Young W. (1990). Neural damage in the rat thalamus after cortical infarcts. Stroke 21, 790–794. Jang, S. H., Bai, D., Son, S. M., Lee, J., Kim, D. S., Sakong, J., Kim, D. G., and Yang, D. S. (2008). Motor outcome prediction using diffusion tensor tractography in pontine infarct. Ann. Neurol. 64, 460–465. Jang, S. H., Cho, S. H., Kim, Y. H., Han, B. S., Byun, W. M., Son, S. M., Kim, S. H., and Lee, S. J. (2005). Diffusion anisotrophy in the early stages of stroke can predict motor outcome. Restor. Neurol. Neurosci. 23, 11–17. Johansen-Berg, H. (2007). Structural plasticity: rewiring the brain. Curr. Biol. 17, R141–R144. Johansen-Berg, H. (2010). Behavioural relevance of variation in white matter microstructure. Curr. Opin. Neurol. 23, 351–358. Johansen-Berg, H., and Behrens, T. E. (2006). Just pretty pictures? What diffusion tractography can add in clinical neuroscience. Curr. Opin. Neurol. 19, 379–385. Johansen-Berg, H., Della-Maggiore, V., Behrens, T. E., Smith, S. M., and Paus, T. (2007). Integrity of white matter in the corpus callosum correlates with bimanual co-ordination skills. Neuroimage 36(Suppl. 2), T16–T21. Jorgensen, H. S., Nakayama, H., Raaschou, H. O., Vive-Larsen, J., Stoier, M., and Olsen, T. S. (1995). Outcome, and time course of recovery in stroke. Part I: Outcome. The Copenhagen Stroke Study. Arch. Phys. Med. Rehabil. 76, 399–405. Karni, A., and Bertini, G. (1997). Learning perceptual skills: behavioral probes into adult cortical plasticity. Curr. Opin. Neurobiol. 7, 530–535. Keller, T. A., and Just, M. A. (2009). Altering cortical connectivity: remediation-induced changes in the white matter of poor readers. Neuron 64, 624–631. Krakauer, J. W. (2006). Motor learning: its relevance to stroke recovery, and neurorehabilitation. Curr. Opin. Neurol. 19, 84–90. Kuhn, M. J., Johnson, K. A., and Davis, K. R. (1988). Wallerian degeneration: evaluation with MR imaging. Radiology 168, 199–202. Langhorne, P., Coupar, F., and Pollock, A. (2009). Motor recovery after stroke: a systematic review. Lancet Neurol. 8, 741–754. Lehmbeck, J. T., Brassen, S., Weber-Fahr, W., and Braus, D. F. (2006). Combining voxel-based morphometry, and diffusion tensor imaging to detect age-related brain changes. Neuroreport 17, 467–470. Liang, Z., Zeng, J., Liu, S., Ling, X., Xu, A., Yu, J., and Ling, L. (2007). A prospective study of secondary degeneration following subcortical infarction using diffusion tensor imaging. J. Neurol. Neurosurg. Psychiatry 78, 581–586. Mabbott, D. J., Rovet, J., Noseworthy, M. D., Smith, M. L., and Rockel, C. (2009). The relations between white matter, and declarative memory in older children, and adolescents. Brain Res. 1294, 80–90. Madden, D. J., Whiting, W. L., Huettel, S. A., White, L. E., MacFall, J. R., and Provenzale, J. M. (2004). Diffusion tensor imaging of adult age differences in cerebral white matter: relation to response time. Neuroimage 21, 1174. Meier-Ruge, W., Ulrich, J., Brühlmann, M., and Meier, E. (1992). Age-related white matter atrophy in the human brain. Ann. N. Y. Acad. Sci. 673, 260–269. Michielse, S., Coupland, N., Camicioli, R., Carter, R., Seres, P., Sabino, J., and Malykhin, N. (2010). Selective effects of aging on brain white matter microstructure: a diffusion tensor imaging tractography study. Neuroimage 52, 1190–1201. Orrell, A. J., Eves, F. F., and Masters, R. S. (2006). Motor learning of a dynamic balancing task after stroke: implicit implications for stroke rehabilitation. Phys. Ther. 86, 369–380. O’Sullivan, M., Jones, D. K., Summers, P. E., Morris, R. G., Williams, S. C., and Markus, H. S. (2001). Evidence for cortical “disconnection” as a mechanism of age-related cognitive decline. Neurology 57, 632–638. Pfefferbaum, A., Adalsteinsson, E., and Sullivan, E. (2005). Frontal circuitry degradation marks healthy adult aging: evidence from diffusion tensor imaging. Neuroimage 26, 891–899. Pierpaoli, C., Barnett, A., Pajevic, S., Chen, R., Penix, L. R., Virta, A., and Basser, P. (2001). Water diffusion changes in Wallerian degeneration, and their dependence on white matter architecture. Neuroimage 13(Pt 1), 1174. Pohl, P. S., McDowd, J. M., Filion, D. L., Richards, L. G., and Stiers, W. (2001). Implicit learning of a perceptual-motor skill after stroke. Phys. Ther. 81, 1780–1789. Rapisarda, G., Bastings, E., de Noordhout, A. M., Pennisi, G., and Delwaide, P. J. (1996). Can motor recovery in stroke patients be predicted by early transcranial magnetic stimulation? Stroke 27, 2191–2196. Rudebeck, S. R., Scholz, J., Millington, R., Rohenkohl, G., Johansen-Berg, H., and Lee, A. C. (2009). Fornix microstructure correlates with recollection but not familiarity memory. J. Neurosci. 29, 14987–14992. Salat, D. H., Tuch, D. S., Greve, D. N., van der Kouwe, A. J., Hevelone, N. D., Zaleta, A. K., Rosen, B. R., Fischl, B., Corkin, S., Rosas, H. D., and Dale, A. M. (2005). Age-related alterations in white matter microstructure measured by diffusion tensor imaging. Neurobiol. Aging 26, 1215–1227. Saur, D., Kucinski, T., Grzyska, U., Eckert, B., Eggers, C., Niesen, W., Schoder, V., Zeumer, H., Weiller, C., and Röther, J. (2003). Sensitivity, and interrater agreement of CT, and diffusion-weighted MR imaging in hyperacute stroke. AJNR Am. J. Neuroradiol. 24, 878–885. Schaechter, J. D., Fricker, Z. P., Perdue, K. L., Helmer, K. G., Vangel, M. G., Greve, D. N., and Makris, N. (2009). Microstructural status of ipsilesional, and contralesional corticospinal tract correlates with motor skill in chronic stroke patients. Hum. Brain Mapp. 30, 3461–3474. Schlaug, G., Marchina, S., and Norton, A. (2009). Evidence for plasticity in white-matter tracts of patients with chronic Broca’s aphasia undergoing intense intonation-based speech therapy. Ann. N. Y. Acad. Sci. 1169, 385–394. Scholz, J., Klein, M. C., Behrens, T. E., and Johansen-Berg, H. (2009a). Training induces changes in white-matter architecture. Nat. Neurosci. 12, 1370–1371. Scholz, J., Tomassini, V., and Johansen-Berg, H. (2009b). “Individual differences in white matter microstructure in the healthy human brain,” in Diffusion MRI: From Quantitative Measurement to In Vivo Neuroanatomy, eds T. Behrens and H. Johansen-Berg (Oxford: Elsevier), 237–250. Sowell, E. R., Peterson, B. S., Thompson, P. M., Welcome, S. E., Henkenius, A. L., and Toga, A. W. (2003). Mapping cortical change across the human life span. Nat. Neurosci. 6, 309–315. Stewart, K. C., Cauraugh, J. H., and Summers, J. J. (2006). Bilateral movement training, and stroke rehabilitation: a systematic review, and meta-analysis. J. Neurol. Sci. 15, 244, 89–95. Stinear, C. M., Barber, P. A., Smale, P. R., Coxon, J. P., Fleming, M. K., and Byblow, W. D. (2007). Functional potential in chronic stroke patients depends on corticospinal tract integrity. Brain 130(Pt 1), 170–180. Stys, P. K. (2004). White matter injury mechanisms. Curr. Mol. Med. 4, 113–130. Sullivan, E., Adalsteinsson, E., and Pfefferbaum, A. (2006). Selective age-related degradation of anterior callosal fiber bundles quantified in vivo with fiber tracking. Cereb. Cortex 16, 1030. Thomalla, G., Glauche, V., Koch, M. A., Beaulieu, C., Weiller, C., and Rother, J. (2004). Diffusion tensor imaging detects early Wallerian degeneration of the pyramidal tract after ischemic stroke. Neuroimage 22, 1767–1774. Tomassini, V., Jbabdi, S., Kincses, T., Bosnell, R., Douaud, G., Pozzilli, C, Matthews, P. M., and Johansen-Berg, H. (2010). Structural, and functional bases of individual difference in motor learning. Hum. Brain Mapp. doi: 10.1002/hbm.21037. [Epub ahead of print]. Tuch, D. S., Salat, D. H., Wisco, J. J., Zaleta, A. K., Hevelone, N. D., and Rosas, H. D. (2005). Choice reaction time performance correlates with diffusion anisotropy in white matter pathways supporting visuospatial attention. Proc. Natl. Acad. Sci. U.S.A. 102, 12212–12217. Walhovd, K. B., Fjell, A. M., Reinvang, I., Lundervold, A., Dale, A. M., Eilertsen, D. E., Quinn, B. T., Salat, D., Makris, N., and Fischl, B. (2005). Effects of age on volumes of cortex, white matter, and subcortical structures. Neurobiol. Aging 26, 1261–1268. Waller, A. (1850). Experiments on the section of the glossopharyngeal, and hypoglossal nerves of the frog, and observations of the alterations produced thereby in the structure of their primitive fibres. Philos. Trans. R. Soc. Lond., B, Biol. Sci. 140, 423–429. Ward, N. S., and Cohen, L. G. (2004). Mechanisms underlying recovery of motor function after stroke. Arch. Neurol. 61, 1844–1848. Werring, D. J., Toosy, A. T., Clark, C. A., Parker, G. J., Barker, G. J., Miller, D. H., and Thompson, A. J. (2000). Diffusion tensor imaging can detect, and quantify corticospinal tract degeneration after stroke. J. Neurol. Neurosurg. Psychiatry 69, 269–272. Winstein, C. J., Rose, D. K., Tan, S. M., Lewthwaite, R., Chui, H. C., and Azen, S. P. (2004). A randomized controlled comparison of upper-extremity rehabilitation strategies in acute stroke: a pilot study of immediate, and long-term outcomes. Arch. Phys. Med. Rehabil. 85, 620–628. Wolf, S. L., Winstein, C. J., Miller, J. P., Taub, E., Uswatte, G., Morris, D., Giuliani, C., Light, K. E., and Nichols-Larsen, D., E. X. C. I. T. E. Investigators. (2006). Effect of constraint-induced movement therapy on upper extremity function 3 to 9 months after stroke: the EXCITE randomized clinical trial. JAMA 296, 2095–2104. Accepted: 10 September 2010; Published online: 02 November 2010. Copyright: © 2010 Johansen-Berg, Scholz and Stagg. This is an open-access article subject to an exclusive license agreement between the authors and the Frontiers Research Foundation, which permits unrestricted use, distribution, and reproduction in any medium, provided the original authors and source are credited.